If I asked you to think of a horse, what would you imagine? A brown horse? Black? Anyone have a ‘My Little Pony’ moment or think of a pink unicorn? I’m fairly sure no-one thought of the actual word ‘HORSE’. This is because we think in images and colours, which stimulate our memories. We then associate sounds and feelings with said images such as the sound of hooves on the ground. Even smells are triggered such as riding a horse on the beach, with the smell of the sea and the wind in your hair… sorry, I got a bit carried away. However, you see my point. Mind maps are an extension of a bog standard concept map by using images, words and colours to trigger memory and are a great way to revise. They stimulate the areas of our brain that recognise and associate image, colour with memory, ensuring that you are able to recall information. Information we learn at school generally enters our brain through our eyes and ears and it is deposited into our sensory memory. But we can pay attention only to a small amount of information. Once something has attracted our attention, it moves into our working memory. The brain notices and remembers colour and images first! 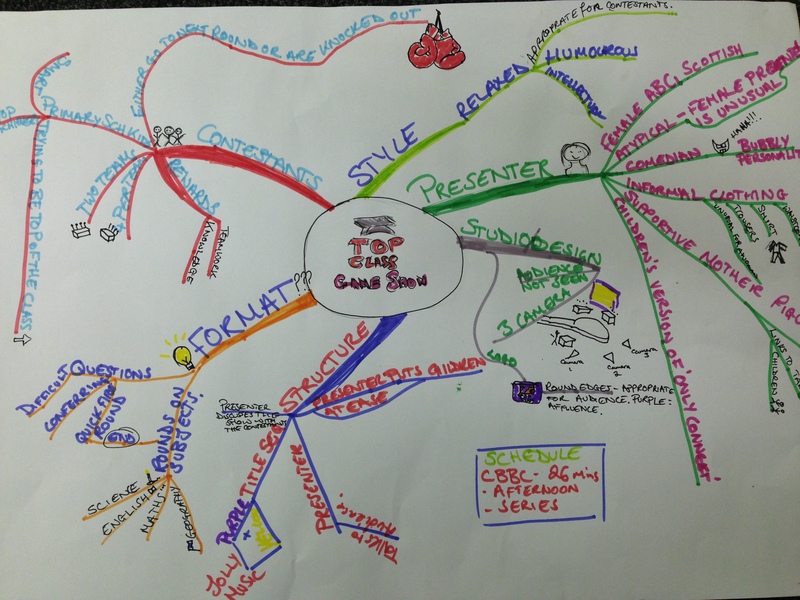 The trick to creating mind maps is to combine colour, images and words to effectively recall information. The best thing about it is that you don’t need awesome drawing skills; the wackier the better. If the drawing you create is funny, you will remember it. It works with all students, and all learning styles. The mind map can take on many different guises. 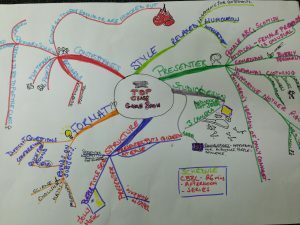 I have created an example of a mind map using the exam topic Game Shows. The students have to remember specific case studies of game shows and it can be tricky to remember all the different aspects such as the format or style. The example mind map I created incorporates all the key words, ridiculously badly drawn pictures (my drawing skills haven’t really developed since I was six years old) and colours that mean something to me. I will be using mind maps with my current year 11’s and they will be able to use the mind maps to do all sorts of revision. For example, they can take just one key idea, presenters, and use the mind map to compare their different case study shows’ presenters and the specific genre and/or audience. I used this method with my year 11 class last year and their feedback was that it’s a great tool; they remembered their mind maps more than any of their other revision methods. Try it…you might like it! Step by step guide to creating a good mind map. The central idea is the starting point of your mind map and embodies the subject you are going to explore. Your central idea should be in the centre of your page and should include an image that represents the A-mind map theme. This draws attention and activates associations, as our brains respond better to visual stimuli. Personalise your central idea. Putting in the time and effort will reinforce the link you have with the subject matter in your A-mind map. The next step is to add branches. The main branches are the key themes. Adding smaller branches helps to delve into each subject or main branch in greater complexity and depth. 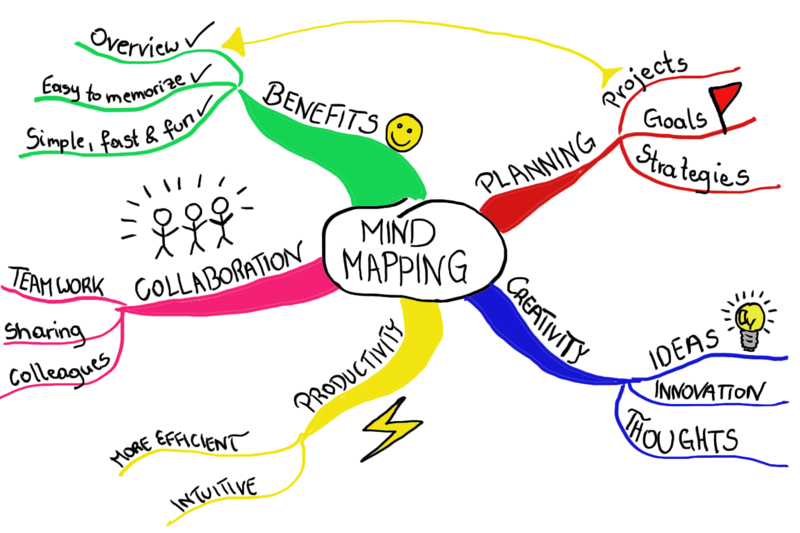 The beauty of the mind map is that you can repeatedly add new branches and you’re not restricted to just a few options. Remember, the structure of your mind map will come naturally as you add more ideas and your brain freely draws new associations from the different concepts. The important thing is that you make sure it is colourful. The more time you take, the better. When you add a branch to your Mind Map, you will need to include a key idea. An important principle of mind mapping is using one word per branch. Keeping to one word sparks off a greater number of associations compared to using multiple words or phrases. The word should be on the line, not at the end. The most helpful part of this is to add a picture. The picture may be completely abstract and bizarre to anyone else but that really doesn’t matter. The point is to make it personal to you. some of that water out. the installation of Windows, all the newest updates, particular configurations, and applications. On this record, yow will discover the ten greatest 1TB external hard drives to buy in 2015. Thanks for sharing your thoughts about mental exercise benefits. I visit each day some websites and sites to read content, but this web site provides quality based writing. has been surprised me. Thank you, quite nice article. Usually I do not learn post on blogs, but I wish to say that this write-up very forced me to take a look at and do so! the truth then again I’ll definitely come again again. brussels. I will be grateful when you proceed this in future. opposite specialists of this sector don’t notice this. You must continue your writing. I was wondering your situation; we have developed some nice methods and we are looking to swap methods with others, please shoot me an email if interested. I every time used to study post in news papers but now as I am a user of web so from now I am using net for posts, thanks to web. I got this web page from my buddy who told me about this site and at the moment this time I am visiting this site and reading very informative articles or reviews here. I read this article completely about the comparison of latest and previous technologies, it’s amazing article. any solutions to help stop content from being ripped off? I’d genuinely appreciate it. Many thanks, However I am encountering difficulties with your RSS. you’re a great author.I will remember to bookmark your blog and definitely will come back someday. What’s up Dear, are you really visiting this website daily, if so then you will absolutely take nice know-how. What’s up, this weekend is nice designed for me, for the reason that this point in time i am reading this wonderful informative piece of writing here at my house. between superb usability and visual appearance. I must say that you’ve done a very good job with this. Thank you a lot for sharing this with all people you actually recognize what you’re talking approximately! Excellent read, I just passed this onto a colleague who was doing some research on that. And he just bought me lunch since I found it for him smile So let me rephrase that: Thank you for lunch! “One who’s our friend is fond of us one who’s fond of us isn’t necessarily our friend.” by Geoffrey F. Albert. I’m very pleased to find this site. I need to to thank you for your time for this particularly fantastic read!! I definitely loved every little bit of it and I have you book-marked to see new things on your website. make any such fantastic informative website. Thank you for some other informative blog. Where else could I am getting that type of info written in such an ideal means? own blog (well, almost…HaHa!) Great job. I really enjoyed what you had to say, and more than that, how you presented it. when you’ve got the opportunity, Guess I’ll just book mark this blog. I found it for him… lol. So let me reword this…. Thank YOU for the meal!! MXWEQA Muchos Gracias for your blog post.Thanks Again. Really Great. you’re stating and the way in which you say it. You make it entertaining and you still take care of to keep it smart. It’s really a nice and helpful piece of information. I’m satisfied that you shared this helpful info with us. this topic for a long time and yours is the best I’ve came upon so far. you sure concerning the source? using? I’m going to start my own blog soon but I’m having a hard time making a decision between BlogEngine/Wordpress/B2evolution and Drupal. the layout in your blog. Is that this a paid subject or did you customize it yourself? Anyway stay up the nice quality writing, it is rare to see a nice weblog like this one these days.. Excellent beat ! I would like to apprentice while you amend your site, how could i subscribe for a weblog site? sure whether or not this publish is written through him as nobody else recognize such targeted about my difficulty. and in fact excellent data designed for visitors. Everything posted made a great deal of sense. But, consider this, suppose you wrote a catchier title? Haydon Learning Blog is a little plain. You might glance at Yahoo’s front page and watch how they create article headlines to get viewers to click. F95aUd This page really has all of the info I needed concerning this subject and didn at know who to ask. Can we have a sequel?